Oh, happy day! The Midnite Drive-In and Hamlette's Soliloquy are hosting The John Wayne Blogathon running from December 9th to the 11th. Click HERE or HERE for all the great contributions. 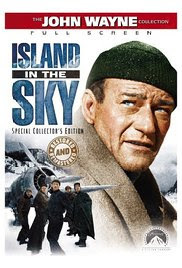 1953s Island in the Sky directed by William A. Wellman is based on Ernest K. Gann's 1944 novel based on an actual incident in northern Canada involving the rescue of a downed plane. Both men were involved in aviation, Gann in WW2 and Wellman in WWI, before turning their hands to directing and writing. Island in the Sky is a harrowing story of survival produced by John Wayne's Batjac for whom Wellman would direct six pictures in the decade, including three starring the Duke. John Wayne is the featured lead player in Island in the Sky with an ensemble cast which includes some of Hollywood's best veteran character actors and up-and-comers. Director William Wellman is the narrator. The plane lands on a lake in uncharted wilderness somewhere in Labrador. Dooley got his crew down safely, but now that are stranded with no generator and, if divided judiciously, perhaps six days worth of food. The sub zero temperatures require energy to keep the men alive and alert. 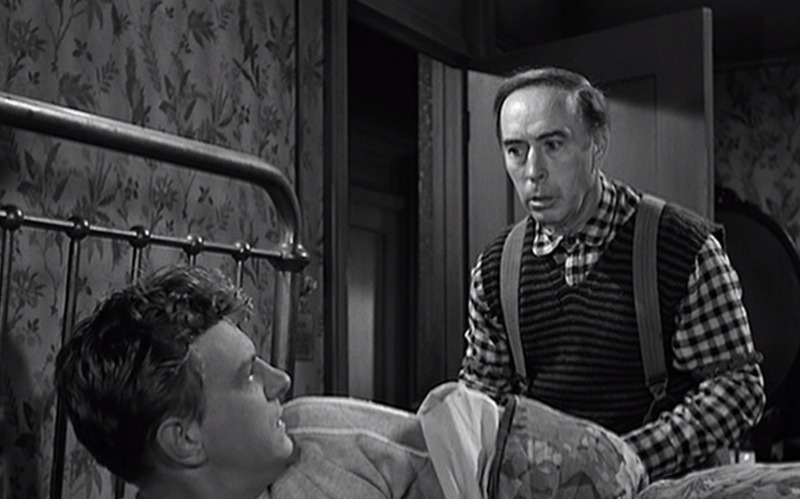 The navigator played by James Lydon (Life With Father) is young and feeling guilty for any part he may have played in their accident. He misses his wife and recently born child. The radio operator played by Wally Cassell (Sands of Iwo Jima) is responsible for using whatever power they have in the best way to let their whereabouts be known. Crewman Stankowski played by Hal Baylor (The Set-Up) will be vital in keeping their efforts manageable. 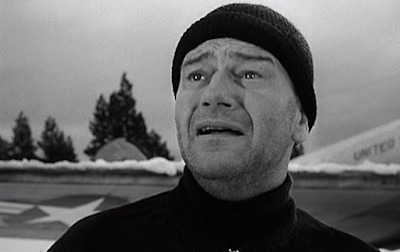 The co-pilot played by Sean McClory (The Quiet Man) is desperate in the search for food. Desperation can be a dangerous thing. 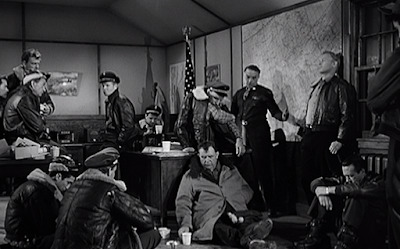 The Colonel in charge of the search effort is played with authority by Walter Abel (Holiday Inn). The one thing he has no difficulty in finding is volunteers for the search. The camaraderie among the pilots is strong, as is their fondness for Dooley. Willie Moon played by Andy Devine (Wild Bill Hickock) may look like his often-played buffoon, with his girth and a penchant for avoiding heavy work, but he is one of the sharpest of the pilots and a leader among the group. His co-pilot is played by Harry Carey Jr. (The Adventures of Spin and Marty) and radio operator by Bob Steele (F Troop). Lloyd Nolan (A Tree Grows in Brooklyn) is a determined yet sentimental fellow. 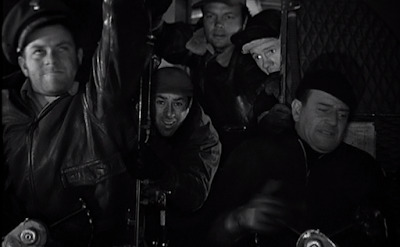 His co-pilot is played by Carl Switzer (Track of the Cat), whose easy-going response to any suggestion "Whatever's customary" is a phrase I am considering adopting. A Batjac contractee with a nice featured role as a young pilot is James Arness (Gunsmoke). He is given a chance to shine and takes it. Nice to see. Allyn Joslyn (Heaven Can Wait) is another respected pilot and another actor who makes the most out of his scenes. Other familiar faces among the searchers are Paul Fix, Gordon Jones, Herbert Anderson, Darryl Hickman, Fess Parker and Louis Jean Heydt. Ann Doran fans will be pleased with her bit as Willie Moon's wife. Two of Bill Wellman's kids play their children. Of course, this being a Wild Bill Wellman picture, there is a part for George Chandler. "I guess we're awful hard to see down here. Awful hard." Watching the earliest of John Wayne films you are aware of his charisma and potential. Rough around the edges, it would take years of on-the-job training for Duke to become an accomplished film actor. His very presence could overwhelm co-stars and that it does not is proof that he was one of those generous actors who learned how to share a scene. The better everyone does, the better it is for the picture. With roles like Dunson in Red River, Brittles in She Wore a Yellow Ribbon and Stryker in Sands of Iwo Jima behind him, John Wayne's work in the 1950s show his versatility and command of his gifts and skill. I find his performance in Island in the Sky to be among his best as he brings to life a man duty-bound to lead and care for his crew while himself battling the elements and starvation along with them. I encourage you to judge for yourself by watching this intense and moving film. The highlight of this film (and the next year's The High and the Mighty), aside from Wayne of course, was seeing Carl "Alfalfa" Switzer as an adult. Having grown up watching "Our Gang" on the Saturday afternoon TV in the 60's and 70's, I always liked Alfalfa best of the Little Rascals. This is a particularly riveting movie just for the story of being stranded, but Wayne makes it even better. Good review. There is something sweetly melancholic about seeing "Alfalfa". It is like running into an old friend from the neighbourhood. Thanks to you and Rachel for hosting the blogathon. There are few actors who give me as much joy as John Wayne. This sounds very interesting! I was not familiar with this one at all, but now want to see this one. Thanks for highlighting it! I think you have just discovered a gem and I'm glad to be a part of it. It's been a few years since I've seen this but intense is definitely the word to describe it!! That music score!! Sometimes I'll be watching a scene in a movie with similar sounding music and I always remark that it sounds like this movie. It really stays in the memory, doesn't it? I first saw it when I was about 11 or 12. Sean McClory's fate never left me. Same here. And I liked him better in this movie then I do in the Quiet Man! I must confess I haven't seen this yet. I own about 8 of John Wayne's films I have yet to watch, including this one, and I tend to watch one each year to celebrate his birthday. You've pretty well convinced me that this is the one I'll be watching come May of 2017. My pleasure to participate. Thanks for hosting. May I say, and it won't be a surprise, you have made an excellent choice for this year's natal celebration. Island in the Sky seems to be one of the lesser know Wayne films but it is definitely deserving of more notice. Solid cast, and a solid film, with The Duke a little more vulnerable than usual. Anyone who gives it a chance will probably agree with your assessment and find it worthwhile. I'm so pleased you found it. Enjoy. I agree that John Wayne's performance here was very strong! And I'll always remember this film as the one that taught me how to pray the Our Father prayer in English! What a lovely connection to a movie! I also haven't seen this one yet. Survival movies aren't my favorite genre; they tend to stress me out too much, and I have to keep pausing the movie and walking away for awhile. Makes for a less-than-stellar viewing experience! LOL! However, I'd still like to see this one at some point because of Wayne, and sounds like a great cast. I'm quite fond of Sean McClory. I understand the stress you mentioned. If the movie is well done then you can't help but feel for the characters and their situation. Island in the Sky is like that so I believe you will be glad you watched it, but the watching will not be your favourite part. Thanks for reading and commenting. A blogathon on John Wayne was just what the doctor ordered this month. Oh! I haven't seen this one, I'll have to try it! Great review! Thanks. I'd consider this one of those hidden gems and well worth your time.